Sheldon Cooper: I'm going to try to do a better job of sharing the spotlight because we're a team. Amy Farrah Fowler: Sheldon, I know this isn't easy, but you'll have a whole lifetime to practice. Sheldon Cooper: I-It could take that long, I'm really bad at it. 28.9.2017 It could take that long, I’m really bad at it. Howard Wolowitz: And we already have one. Penny Hofstadter: You know, whenever I find a top I like, I always go back and get a second one in a different color. (pause) Which I hope is not the case with your baby. 28.9.2017 Get a second one in a different color. Sheldon Cooper: Let me give you a better question. Here, um, "Dr. Cooper, I heard you were working on a top-secret project for the U.S. military. Why don't you tell us about that?" See, that's a great question. Amy's colleague: Okay, what was that like? Sheldon Cooper: Oh, I can't tell you that, it's top-secret. 28.9.2017 I can’t tell you that, it’s top-secret. Rajesh Koothrappali: Why am I buying them a gift? They have love. Screw them and their happiness. What do you have for someone who's bitter and alone? 28.9.2017 What do you have for someone who’s bitter and alone? 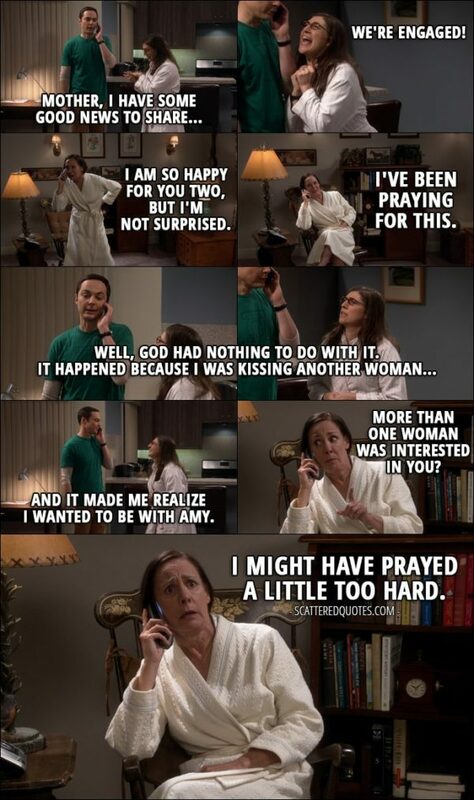 Mary Cooper (reacting to Sheldon getting engaged): Lord, thank you. Even though you can do anything, that was MIGHTY impressive. 28.9.2017 Even though you can do anything, that was MIGHTY impressive. 28.9.2017 Anywhere Jesus is is a church. 28.9.2017 I might have prayed a little too hard. Sheldon Cooper (with Leonard and Penny on the phone): We're not engaged, yet. She's taking forever to answer. Amy Farrah Fowler: Because you're on the phone! Sheldon Cooper: We'll call you back. 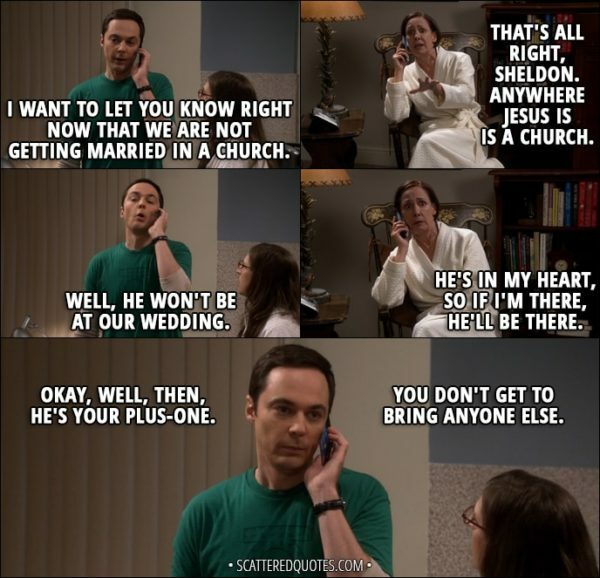 (Sheldon ends the call and calls again a second later) She said yes. 28.9.2017 We’re not engaged, yet. She’s taking forever to answer.